“I sat frozen on the bed. Staring. Three dark eyes stared back and winked at me in sequence. There was a living creature in my holdall. It was like nothing on earth. Tim’s fathers work at the space station is very important, so important in fact that he can’t tell tim what it involves. That is until one day when the earths environment issues suddenly disappear and Tims father is the only one who sees an issue with it. When natural disasters strike and Tim’s fathers concerns are laughed at he pulls Tims out of school and stops going to work. But what follows is even crazier. The two of them are kidnapped and forced to a secret underground lab in the North Pole so that Tims father can work on learning about the aliens that are visting the planet, yes that’s right… Aliens. But while the adults work away tim and his new friends discover their own things about space and the visiting beings. Can they, Herbert the goldfish and Little G, the friendly alien living in the lab, discover the key to saving the world? What a fun book. Honestly I wasn’t sure if I would enjoy this, it sounded great and funny but middle grade isn’t always for me and I’d never read an alien based middle grade book, and now I’m glad I have! The storyline is pretty eccentric and to be honest it reads like a hitchhikers guide to the galaxy for kids, but that’s not a bad thing at all! It’s insane but it works and it really makes this book what it is, without the craziness that is Tim’s life, the alien invasion would have been nothing, and without that Tim’s life would be less interesting. Aliens Stink was fun, educational in the way that it made me think about things in different ways, and most of all a good indication of what I’d want my kids to be reading at 8+. The writing was a bit scatterbrained but I think that was done purposely because of every thing that was going on in Tim’s mind at the time. The bits with little g were probably my favour because the language was the key there and if you really thought about it then you could have worked out what was going on way before the characters did but only if you deciphered his code. There were some kinda scientific bits that could possibly confuse younger kids who weren’t into that kind of thing and some jokes that will work best on the adults in the room but I think it was a great all round book. The addition of images and comic strips really made me laugh and I loved side notes and extra tidbits that you get from them. This was my first Steve Cole book even though I had heard of him plenty of times before, but I’m gonna make sure it’s not my last. I will have a lot of fun reading his books in the future I think, especially when I have kids of the reading age who can enjoy them. 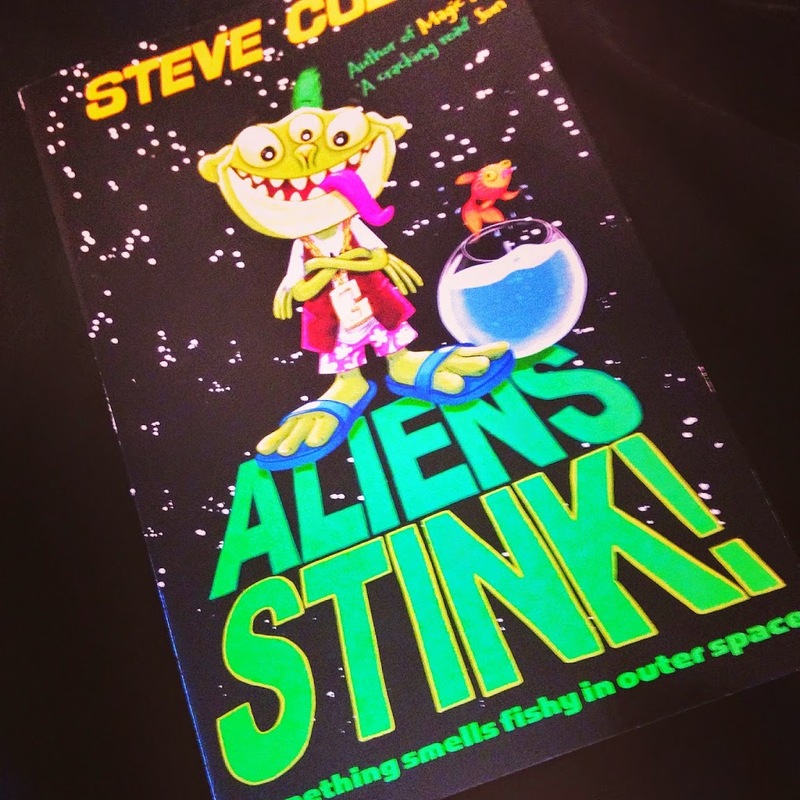 Aliens Stink was published on May 8th by Simon & Schuster. My copy was sent from the publisher in exchange for an honest review.